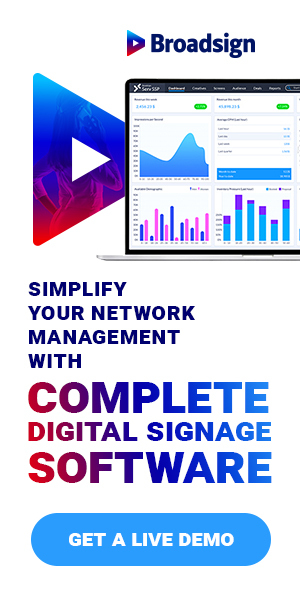 If you are looking for the very latest in Retail and Workplace Communications digital signage solutions visit Signagelive booth 2418. Come and speak to our team to find out how to leverage the Signagelive platform in customer facing retail communications and visual KPIs across sales floors or manufacturing environment. All existing and prospective partners, customers and vendors who would like to discuss the latest innovations in digital signage solutions. Five years showing at DSE – how it has changed – Visitors are more educated and focused on ‘what can be achieved’ not just the ‘how do you do it’. Exhibitors are doing a much better job of showing technology in context, not just selling their latest ‘speeds and feeds’. We are always on the look out for content and app partners who we can collaborate with and add to our Marketplace to provide incremental value to our resellers and customer. We also like to check-out the newcomers to see what they are bringing to the digital signage market. Meeting with all existing and prospective partners, customers and vendors to discuss our latest innovations and how easy it is to produce a simple digital signage solution that looks amazing.